HOUSTON – Lawyers from the Houston complex commercial litigation law firm of Ahmad, Zavitsanos, Anaipakos, Alavi & Mensing P.C. have earned selections as two of the Top 100 lawyers in Texas in the prestigious Texas Super Lawyers listing of the state’s top attorneys. Joe Ahmad and John Zavitsanos, two of four firm lawyers named to the overall Texas Super Lawyers list, were selected by other attorneys to the list of the Top 100 Lawyers in Texas and Top 100 in Houston. Both Mr. Ahmad and Mr. Zavitsanos also are named in the 2012 listing of the country’s top lawyers published by The Best Lawyers in America. Both attorneys have earned the highest possible AV rating from Martindale-Hubbell and both are members of the prestigious American Board of Trial Advocates, an elite group of the country’s leading judges and civil trial lawyers. The annual Texas Super Lawyers list is based on a statewide survey that asks attorneys to nominate their peers. A blue-ribbon panel of lawyers assists with final selections, and fewer than 5 percent of all attorneys earn the Texas Super Lawyers recognition each year. This year’s list is published in the October 2011 editions of Texas Monthly and Texas Super Lawyers magazines, and is available online at www.superlawyers.com. Mr. Ahmad primarily represents executives in litigation, including trade secret and non-compete cases. He is Board Certified in Labor and Employment Law by the Texas Board of Legal Specialization, and has been recognized as one of the country’s leading labor & employment law attorneys by Chambers USA. Mr. Zavitsanos primarily represents companies and individuals in complex commercial disputes and oil & gas litigation. He regularly is hired by other lawyers on the eve of trial to assume first chair trial responsibility based on his experience trying more than 75 cases to verdict. His trial expertise includes cases involving financial services, construction, oil & gas, complex commercial disputes, director and officer liability, and non-compete/trade secret disputes. Mr. Zavitsanos, who is frequently asked to speak on trial tactics and strategies, has earned selection to the Texas Super Lawyers list since 2003, and has been included in the list of Texas’ Top 100 lawyers for five years in a row. This is the seventh year he has earned selection in The Best Lawyers in America. Ahmad, Zavitsanos, Anaipakos, Alavi & Mensing P.C., or AZA, is a Houston-based law firm that is home to true courtroom lawyers with a formidable track record in complex commercial litigation, including energy, intellectual property, securities fraud, construction, and business dispute cases. 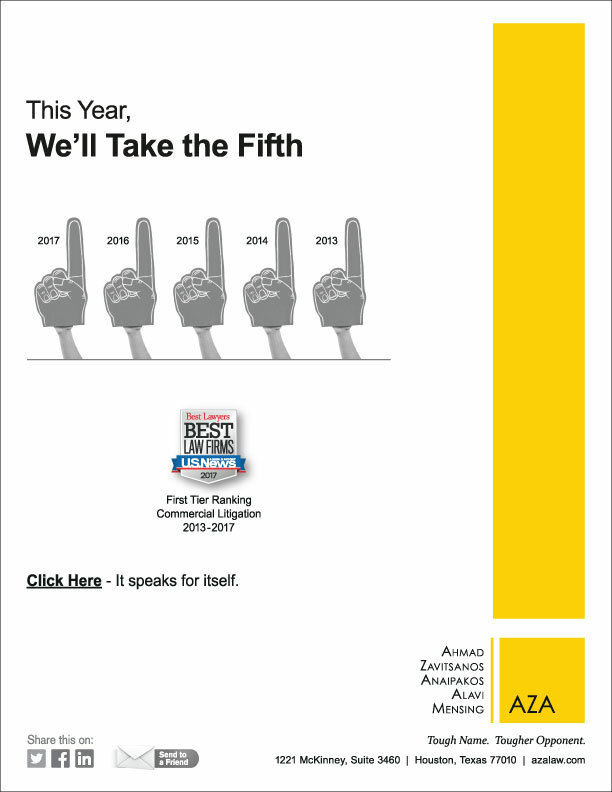 AZA is one of only 32 firms in the U.S. to be recognized as “awesome opponents” in a nationwide poll of corporate general counsel who were asked to name the law firms they hope their companies never have to face in court. In fact, AZA has been hired on many occasions by the same companies the firm has prevailed against at trial. More information about the firm can be found at www.azalaw.com.